Decorative large format prints from digital photographs are becoming ever more popular. The artistic possibilities offered through post editing of digital images make canvas prints an ideal medium for decorative art at home or in an office. The resolution of even some cheap digital cameras suffices today for large format prints. As with any “light drawing” the work is only as good as the artist. Digital photography does not only allow to “snap away” at virtually no cost; higher resolution cameras allow to further enhance good pictures. In line with the trend to print outstanding images, a growing number of online photo printers who are selling prints and posters are also offering laminated, framed enlargements and photo canvas printing. Many modern so called photo canvases are not printed on traditional linen. For good reasons man-made fibres are being used. Such synthetic fibres have a finer, more even structure and allow to optimise the materials so that the inks perfectly adhere to the fabric, improving longevity and colours. As a result, all canvas prints in this review can be swiped with a humid cloth. Stretching a printed cloth evenly over a wooden frame requires skill. Most services supply the photo canvas mounted on a wooden frame. Both FotoInsight and Printing-1 supply the canvas print wrapped around the sides of a wooden frame, ready to hang on a wall. As this does away with heavy glass, the frame is surprisingly light and should hold onto even the weakest plaster board wall of modern houses. FotoInsight’s frames are delivered with all the necessary parts to suspend them on a wall. Synthetic fibres resist the tension of the stretch over the frame and therefore do not need re-tightening. From the broad range of online photo services in Britain we separated those delivering softened, greyish, orangey or dark images and those that are simply too expensive and instead focused on reviewing two leading photo canvas print services. The main criteria were range of products, ease of use, delivery time, quality, support and price. FotoInsights range of decorative print products on canvas, laminated posters, gallery and acrylic prints, including a Nielsen wooden frame, is probably one of the most comprehensive on the Internet. Posters are processed on photographic paper and have bright colours and a satin surface. FotoInsight offers a lamination to seal the surface, which makes heavy, reflective glass redundant. Printing-1’s offering is more specialized covering photo books, calendars, poster and canvas prints (no framing). FotoInsight offers canvas prints in only twelve sizes, from 20×30 cm (12″x8″) to a maximum of 90×130 cm (52″x36″). Printing-1 offers a phenomenal range of 55 sizes, which increase in 10 cm (4″) steps from 30 cm (12″) to 120 cm (48″) for each side. Any size from 30×30 cm (12″x12″) or 30×120 cm (48″x12″) to 120×120 cm (48″x48″) is possible, or any combination in between (in 10 cm / 4″ increments). Both photo services offer free software to design the photo album or canvas. After uploading a picture to Printing-1 using the client software, the user has to use an Internet browser to log into the website before the print can be ordered. The advantage of the web account upload is, that it allows the user to show others their print project online before buying and also to allow friends and family to buy their own prints. This seems convenient for photo books, especially for a wedding album or other festivities. For one-image-products like a poster or photo canvas it seems an unnecessary complication. FotoInsight offers two routes to order. Those who want to print just a single picture do well with the web-upload through their browser. Using this route gives access to all large print products like canvas with or without frame, collage canvas, Alu-Dibond or acrylic poster prints and XXL posters. FotoInsight offers text tools and highlights the frame fold area; but the browser upload misses tools to zoom and position the image. The free ordering software “FotoInsight Designer” provides a zoom tool, however FotoInsight print on the area folded over the frame. Those who wish to avoid that a computer algorithm optimises the colours of their prints, should use the FotoInsight Designer software’s option to turn this feature off. Also people who wish to upload several images or higher resolution pictures should better use the ordering software tool. Another feature of the FotoInsight Designer software are templates, which help to elegantly layer several pictures on a canvas. The canvas prints from FotoInsight reached us in four days (though the ones ordered with a frame took a full week longer). The photo canvas prints from Printing-1 took five working days. The fabric used by Printing-1 has a fine structure and a more paint like ink, which gives more of an impression of a classic canvas. The fabric is stretched over a wooden frame and stapled to it. The colours look brighter and less warm than with FotoInsight. Especially when FotoInsight’s “automatic image correction” has been activated during the upload, the colours tend to use a skin friendly spectrum, which may help portraits, but can be undesirable on landscapes, specially with snow. When turning the “automatic image optimization” off, FotoInsight offers outstandingly realistic colours. 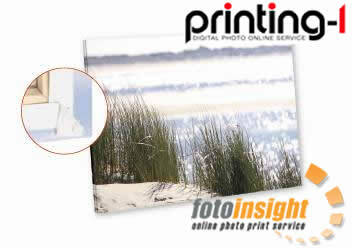 The material used by FotoInsight is a fine, synthetic fabric, appearing more real, with good colours and contrast. FotoInsight prints at 300 dpi, a resolution higher than most services and states that it “uses man made optimised fibres and fade-resistant archival inks to guarantee longevity and brilliant colours, with all materials guaranteed by their manufacturers to last 100 years”. Both firms provide support by email. During office hours we received a reply the same day. In addition to email support, FotoInsight offers also free telephone support under telephone number 01926 463117. Longer service hours in the support team would have lead to full marks. A mounted canvas print does not require a frame. If you want one, it will be as expensive as the mounted print. For that amount, FotoInsight offers professionally cut Nielsen frames with a float (i.e. a gap between the edge of the canvas and the frame to display the area folded over the edge). FotoInsight £4.49 for a 20×30 cm canvas, raising to £8.99 for the largest 90×130 cm format). Printing-1 £9.90 (faster 5 day turnaround £16.40). In the final count FotoInsight leads with 60 points ahead of Printing-1 with a respectable 51 points. If a classic canvas structure is desired or flexible formats are required, Printing-1 is worth the extra money and time. Those who can do with a standard format or want a high resolution print with warmer colours can save money with the test winner FotoInsight. From this review, we excluded photo canvas services with prints that can’t fulfill modern expectations. If you choose to print your canvas with Printing-1 or FotoInsight should depend mainly on the specific characteristics of each service, which we have tried to outline here, are most important to you. We hope, that the information in this review will help to make the right choice and that your canvas print will deliver lasting visual pleasure.